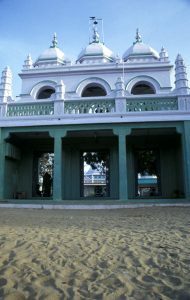 Ramanathapuram also known as Ramnad or Mugavai is one of the oldest places in Tamilnadu and famous for its link with Ramayanam. The Ramanathaswamy temple by itself is a delight for every tourist. 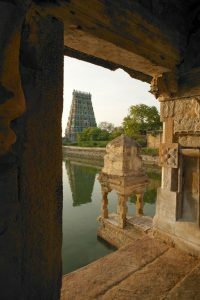 With its magnificent, imposing structure, long corridors, aesthetically carved pillars, the temple is adorned with a towering 38-metre ‘Gopuram’. 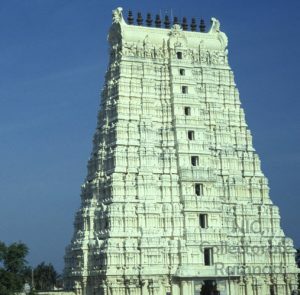 The temple itself was built by rulers since the 12th century with Sethupathy Maravar beginning the construction of the grand Ramanathaswamy temple that boasts of the ‘Third Corridor’, completed by his successor, Maravar – the longest one in Asia with a 197-metre span from East to West and a 133-metre span from South to North, the third largest in the world! It is said that Swamy Vivekananda offered prayers at this temple in 1897. It is also one of the twelve Jyothirlinga temples, where Shiva is worshipped in the form of a Jyotirlingam. The legend says that Hunuman was sent by Lord Rama to bring a Lingam to worship at an appointed auspicious hour. As Human’s arrival was delayed, Sita moulded a lingam for Rama’s timely worship. It is the main being worshiped as Ramanathaswamy. Disappointed Hunuman was later consoled by Rama by installing the Lingam which was brought by him a little north of Ramanatha, and decreed that the Hunuman’s lingam should have precedence over the Ramanatha in all honours. 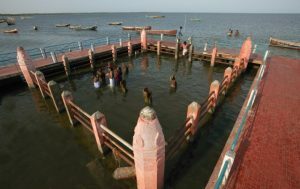 The calm shallow water-spread of the sea, present hardly 100 meters in front of the temple gopuram is considered as sacred. A dip in the Agnitheertham is considered to remove the sins of the pilgrims. The other theerthams (holy water tanks) in and around the temple are also important for Pilgrims. The southernmost tip of the rameswaram island is called Dhanushkodi. It was completely washed away by a cyclone in 1964. But the Kothandaramasamy Temple here remains intact. 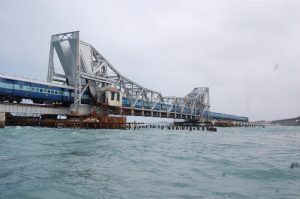 It is 18 KMs way from Rameswaram can be reached by road. A popular belief is that, it is where Vibishana a brother of Ravana surrendered before Rama. Dhanushkodi has a fine beach, where Sea surfing is possible. Avul Pakir Jainulabdeen Abdul Kalam, better known as A. P. J. Abdul Kalam who was the 11th president of India. Kalam was born and brought up in Rameswaram and became a scientist and worked for DRDO and ISRO. After his sudden demise at Shillong on 27th July 2015, he was laid to rest at Pei Karumbu, Rameswaram on 30th July 2015. A memorial has been built at the burial site. 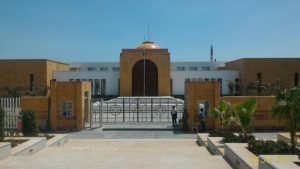 Inside, the memorial, one can see the selected photos, paintings and miniature models of misssiles etc.,. The memorial is less than 1 km from Rameswaram. A coastal village is also known as Navashabashanam.It is believed that Lord Rama worshipped Navagraha here. The temple near by here, is dedicated to Devi, who is said to have killed the demon Mahishasura at this spot. Hindus perform religious rites for their forefathers here. Thiruppullani: Also called Dharbasayanam, the Vishnu Temple here, is dedicated to Lord Adi Jaganathaperumal. It is 10.2 KM from Ramanathapuram. Lord Rama prayed to the Samudraraja (God of Ocean) to seek way to reach Lanka. He did a penance (thavam) lying in Kusa grass (tharuppai), and this act is described Dharbasayanam in Sanskrit. 18 KMs from Ramanathapuram is Uthirakosamangai. There is an ancient Siva temple, where the presiding deity is carved in Emerald. Annual Arudhra festival in December attracts a large number of devotees. The tomb of Sultan Ibrahim Syed Aulia, who came from Arabia via Cannanore about 800 years ago. Pilgrims from far off countries like Srilanka, Malaysia and Singapore are visiting this tomb. Santhanakoodu Festival is celebrated in February-March attracts thousands of pilgrims.